When Holly Dry enrolled in an online jewelry class with her daughter, she had no idea it would be the springboard for her small business. What started as a creative way to spend time together quickly turned into a shared passion for mother and daughter. And when friends and neighbors starting asking to buy their jewelry a few months later, Hello Holly was born. 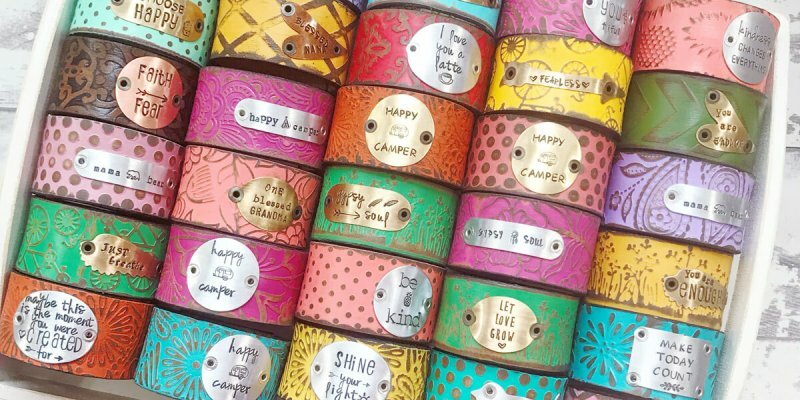 Located on the Gulf of Mexico in Venice, Florida, Hello Holly offers original hand-stamped bracelets, necklaces, keychains, and more. In addition to peddling her wares on Etsy, Holly’s jewelry is carried in approximately twenty boutiques across the nation – and the demand for her products is steadily rising. In 2016, Holly built a studio on her property to streamline her workflows and better accommodate the influx of orders. This year, Holly hired her first assistant. Hello Holly is still a family affair, though: Holly’s daughter is often still found in their studio creating jewelry while their family dogs look on. Although Hello Holly flourished quickly, success hasn’t come without challenges. Since the business evolved from a hobby, Holly didn’t have a stockpile of startup capital to launch with. She’s kept Hello Holly growing by simply reinvesting the profits back into her company. Holly’s rheumatoid arthritis poses another kind of challenge: sometimes she’s forced to take a break from the hours of cutting, filing, stamping, staining, sealing, distressing, and embossing until the pain and stiffness subside. Holly encountered yet another challenge this past September when Hurricane Irma forced her to evacuate to South Carolina. Despite a week spent repairing uprooted trees and a downed fence, Holly’s home and studio were free of structural damage. The limited downtime enabled Holly to restart production just in time for the holiday orders to start rolling in. Florida recently ranked No. 6 on Lendio’s 2018 Top 10 Best States for Small Business Lending. Read more about why the Sunshine State is such a thriving hub for small business.